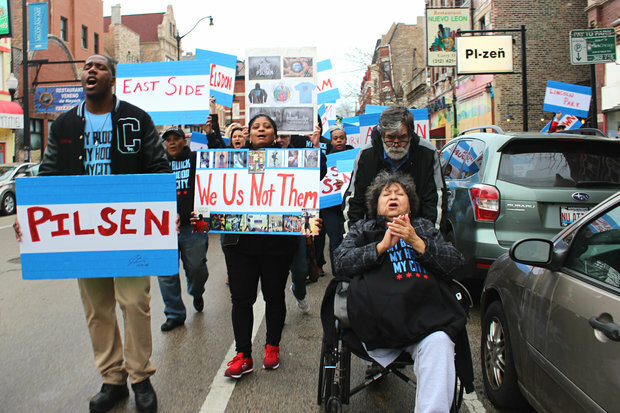 PILSEN — In the face of rapid change, longtime Pilsen residents won’t let their beloved neighborhood become another Wicker Park, one activist said at a rally Sunday. 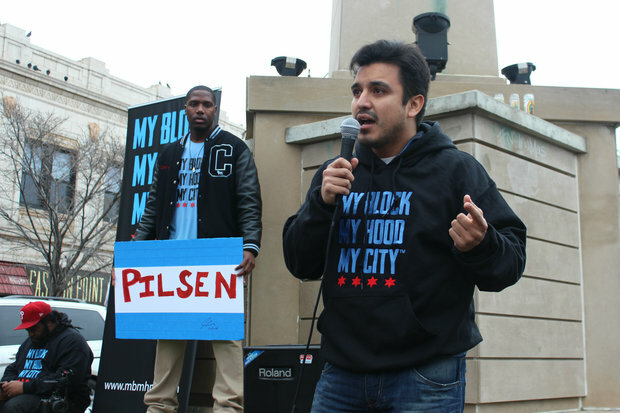 Byron Sighco, new executive director of Pilsen Alliance, said the neighborhood is under attack at a My Block, My Hood, My City rally and march in Pilsen Sunday. Sighco was joined by 100 people from across the city, who carried signs representing every Chicago neighborhood as they marched down 18th Street. Sigcho said the “hostile takeover” ushered in by greedy developers is destroying the culture of Pilsen and dismantling the community in the process. 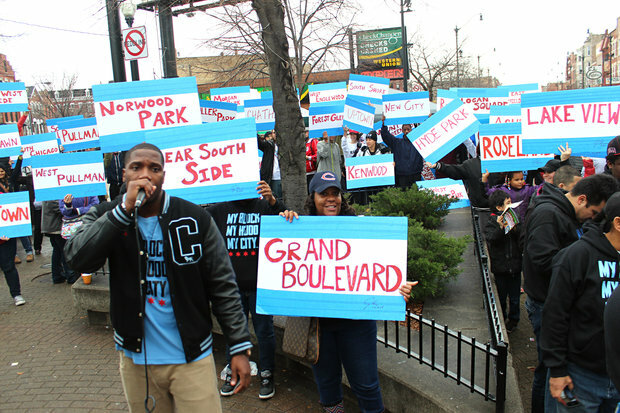 Jahmal Cole, founder of My Block, My Hood, My City, a non-profit that takes teens from Chicago’s under-resourced neighborhoods on trips to explore different parts of the city, said Sunday’s rally aimed to lift “18th Street up” and elevate issues in the community. It’s the smallest units of local identity — block clubs, libraries and community groups — that will shape Chicago’s future, he said. 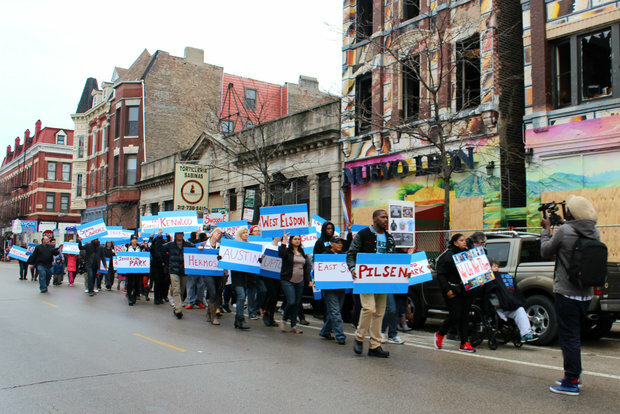 During the two months he spent volunteering in Pilsen ahead of the rally, Cole said he quickly learned gentrification was a top concern in the neighborhood. On Saturday, My Block, My Hood, My City leaders brought a group of 20 North Lawndale teens to explore Pilsen’s sights, sounds and eats. Cole said he hopes the rally creates a new connection between communities. “There’s a new community being built in Chicago. And to be a member of this community, it’s not about party affiliation, it’s not about union affiliation, it’s not about gang affiliation, right? The only thing you need to be a member of this community is your commitment to travel beyond your own block or your own ‘hood,” Cole said. In a city of have and have nots,” Chicago is only as strong as its weakest link,” Cole said. My Block My Hood My City leads teens in exploring different parts of the city,introducing them to new cultures and sights once a month. Among other trips, Cole’s group has taken teens from Englewood to explore Wicker Park, teens from Humboldt Park to explore Edgewater and teens from North Lawndale to explore Greektown. Cole started the group after speaking with teens at Cook County Jail and hearing them talk about their experiences in Chicago. Many had never been outside of their violence-ridden neighborhoods, Cole said. These teens from under-resourced areas not only suffered from “a poverty of finance” but a “poverty of imagination, a deficit of hope,” Cole said. “I thought it was tragic they didn’t feel a part of something bigger than the outside of the few block radius in which they live. I knew immediately had to do something about it,” Cole said. The non-profit My Block, My Hood, My City is funded entirely through the sale of hoodies and T-shirts and donations for now. The organization recently launched aGoFundMe campaign which aims to raise $146,000 to support the hiring of a full-time executive director and three part-time staff members and to fund monthly explorations for teens in need.